Like flights, shafts come in a vast variety of lengths, materials and colors. A selection of nylon shafts. These shafts are cheap, so when anything breaks replacement is not too expensive. A bad problem is that these shafts tend to break at the thread when dropped. It can be quite difficult to get the remaining thread out of the barrel. There is a special tool available for that (see tools page), but a standard method is making a screwdriver hot and stick it in the remaining thread piece. Then you can screw out the remaining thread piece easily. A selection of aluminum shafts. These shafts are more expensive than nylon, but also last longer. You won't face the problem with darts breaking at the thread. But aluminum darts tend to bend when dropped, and it is quite difficult to bend them into right shape later. Aluminum shafts are heavier than nylon shafts, which can lead to problems in flight tuning. Titanium shafts like these are the latest development in shafts technology. They have all advantages of aluminum darts, but don't bend that easy. But they are also the most expensive shafts. These are small rings that are used for keeping the flight on the shaft. I don't recommend using them. The reason is that they really fix the flight quite strong on the shaft. Once you are getting better you will be able to achieve a closer "grouping" of your darts. Close grouping is very important in darts. 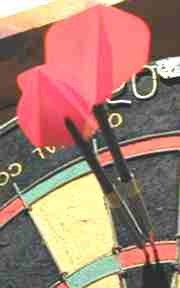 You will you ever achieve the top 180 score without being able to group your darts closely together? 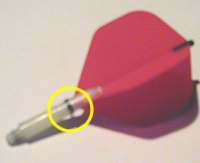 If you have your flight fixed on the shaft it is very likely that you will have deflections when you are grouping your darts closely. 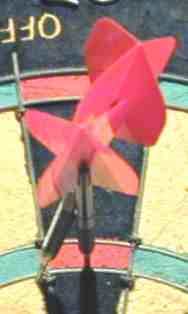 Deflection is when the target of your incoming dart is obstructed by a dart already sticking in the board. The incoming dart has no space, and is -- well, deflected by the dart in the board. When your flights are fixed in the shaft then deflections are very likely. If they are sticking loose enough on the shaft then the flight can simply pop off, so there is no negative effect by a deflection. 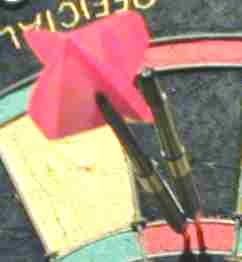 First dart placed nicely in treble 20. Cool! Ouch! The first dart was placed nicely, but your second dart, that was on the way for another T20, was deflected into the 5. Damn. Now see what happens if your flights are loose enough on the shaft: The flight popped off, and the second dart also found its way into the T20. The attaching strength of a normal nylon shaft is enough to keep your flight on the shaft when the dart is flying through the air. But when it enters the board and hits a dart already sticking there, the flight can pop off and avoid deflection. With shaft rings this would not be possible.